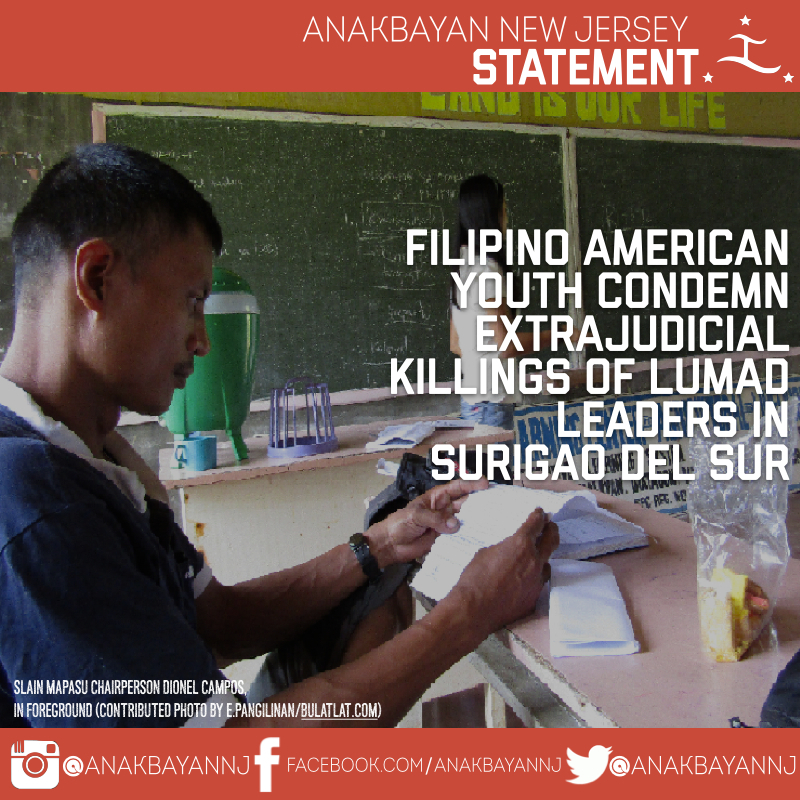 Anakbayan New Jersey condemns in the strongest terms the extrajudicial killings, harassment, illegal occupation, and forcible evacuation of Lumad indigenous communities surrounding the Alternative Learning Center for Agricultural and Livelihood Development (ALCADEV), an alternative indigenous school in Sitio Han-Ayan and Km. 16 of Surigao del Sur, Mindanao. These atrocities were committed by military and paramilitary groups that are organized and armed by the Armed Forces of the Philippines to attack their fellow Lumads as part of the Philippine government’s counterinsurgency program, Oplan Bayanihan. After ALCADEV’s three-day Foundation Day celebration, three indigenous leaders and community educators were violently killed on school grounds and in surrounding communities by paramilitary forces on September 1. The Executive Director of ALCADEV Emerito “Tatay Emok” Samarca was restrained, tortured, and stabbed in one of the classrooms. Malahutayong Pakigbisog Alang sa Sumusunod (MAPASU) Chairperson Dionel Campos and his cousin Aurelio Sinzo were shot by paramilitary in the midst of other community members. The school and the Han-Ayan community continue to be occupied by armed elements of the paramilitary Magahat/Bagani Forces, who are pressuring the community to evacuate within two days lest they be massacred. On Thursday, August 27 two brothers in Surigao del Sur were also killed by alleged members of the tribal forces locally known as Bagani Force. On August 30, about thirty armed elements of the military and paramilitary occupied ALCADEV, threatening the staff, faculty, and community members. The next day, the community cooperative of MAPASU was burned down and paramilitary forces fired into the community indiscriminately. The Han-Ayan residents are currently in Km. 16, awaiting assistance from the local government unit. ALCADEV and Tribal Filipino Program of Surigao Sur (TriFPSS), the primary school counterpart of ALCADEV, provide culturally relevant and mass oriented education to indigenous communities, a service that is otherwise not provided to the people by the current Philippine government. The schools equip the indigenous with crucial skills like literacy, agricultural education, and an understanding of their political and human rights. They have been vocal in their support of MAPASU’s community campaign against development aggressions like large-scale mining and plantation, rightfully fighting for their ancestral lands. Because of the Lumad struggle for their ancestral domain, these alternative indigenous schools have been maliciously tagged as “NPA schools” and have been subject to disruption, occupation, and military violence. This recent spate of human rights violations is one example in a long list of state-sponsored terrorism under President Benigno Aquino III’s premier counterinsurgency program “Oplan Bayanihan.” In it, Aquino’s centerpiece “peace and development” program aims to crush the armed revolutionary movement by the end of presidential term in 2016. Instead of peace, the US-backed Oplan Bayanihan has brought death, displacement and more suffering to Philippine communities, especially to indigenous communities like the Lumads of Surigao del Sur. The Lumad communities of Caraga region have been experiencing intensifying counterinsurgency, holding mass evacuations from the hillsides to the barrios almost every year since 1987. Instead of development, Oplan Bayanihan has paved the way for more environmental destruction by facilitating the encroachment of foreign mining companies and plantations into indigenous lands, as well as the displacement of entire communities. As Filipino Americans, we must be aware of the US government’s complicity in the militarization, displacement, and murder of indigenous peoples and activists in the Philippines. The American government allocates 50 million dollars of our tax money every year towards foreign military financing which aids in human rights violations and strengthens counterinsurgency against community leaders. The disruption of learning, military occupation of schools, the traumatizing killings of community leaders, and the hardships that accompany evacuations cannot be ignored by the international community. As Filipino Americans, we must stand with and alongside the Lumads of Surigao del Sur who have long struggled and continue to struggle for land, rights, and education! JUSTICE FOR EMERITO SAMARCA, DIONEL CAMPOS, AURELIO SINZO, CRISANTO AND SINZO TABUGOL BROTHERS! END THE MILITARIZATION OF LUMAD SCHOOLS! END OPLAN BAYANIHAN & STATE SPONSORED VIOLENCE! NO TO U.S. MILITARY AID FOR STATE-SPONSORED TERRORISM IN THE PHILIPPINES! 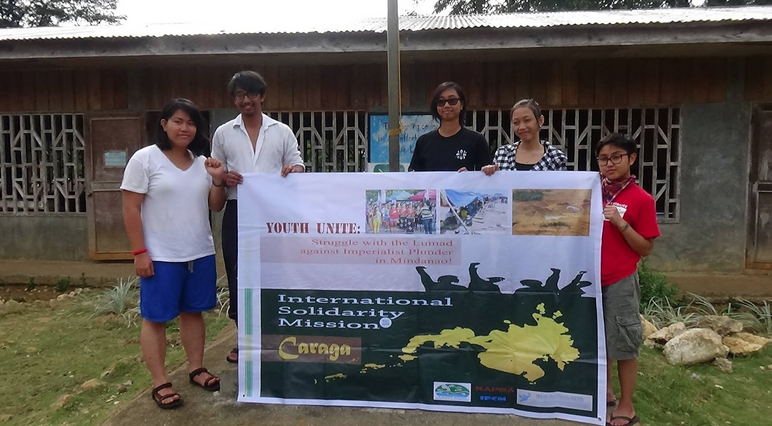 Members of Anakbayan New Jersey & New York in Han-Ayan for the Kapit Bisig Kabataan Network Relief and Rebuilding Mission – International Solidarity Mission last August 3 to 9, 2015. Reblogged this on Anakbayan Toronto.